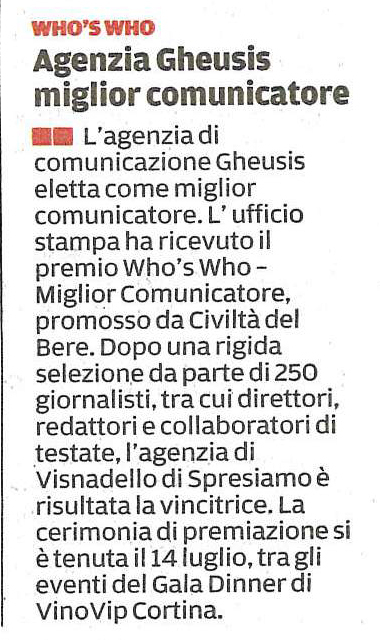 Gheusis won the first edition of Civiltà del Bere magazine’s Who’s Who award as the Best Communicator in Italy specialising in wine and food. The choice was made by a group of 250 journalists, including the editors of (and correspondents for) various publications. This result made us very proud and has spurred us on to work in an even more dynamic and effective fashion. The awards ceremony took place on 14th July 2013 during the Gala Dinner of VinoVip in Cortina. The jury of the “Who’s Who In Wine Award”, promoted by Civiltà del Bere magazine and devoted to the best communicator in the world of wine, has given its verdicts. In the category of the best internal communicator for a particular producer, the winner was Tiziana Mori of Gruppo Italiano Vini, ahead of the nonetheless excellent Giulia Dirindelli of Chianti winery Cecchi and Francesca Facchetti, of Berlucchi. Amongst the P.R. agencies, on the other hand, it was Veneto-based “Gheusis” who beat – by a whisker – the Florentine “Turner” studio and the very talented Marzia Morganti Tempestini’s “Marte Comunicazione”. It may seem banal, but you should only communicate when you have something to say. That isn’t always the way things actually work: often we’re besieged with “news” items that are useless, lacking in interest and of modest importance. Once we had decided that it was time to make ourselves better known, we sought out someone who – better than anybody else – would be able to convey our philosophy and tell people about us in the most coherent and effective way. We chose Gheusis for various reasons, the first of which is the respect and trust we nurture for Silvia, the founder of the agency. At Gheusis, professionalism, indispensable - but not to be taken for granted – in a company of this type, goes hand in hand with discretion and with a capacity for listening and sharing information, which constitute the fundamental elements in working really well as a team. Gheusis’ attention to the continuous training of both our teams and its actual participation in the various events it proposes act as the binding agents for our joint collaboration. The Gheusis P.R. agency has been elected as Italy’s best communicator. This press office received the Who’s Who – Best Communicator Award, promoted by Civiltà del Bere magazine. After a strict selection by 250 journalists, including the editors of (and correspondents for) various publications, the Visnadello di Spresiano-based agency came out as the winner. The awards ceremony took place on 14th July, as one of the events during the Gala Dinner of VinoVip in Cortina.